All American dessert is Best Ever Homemade Apple Pie. 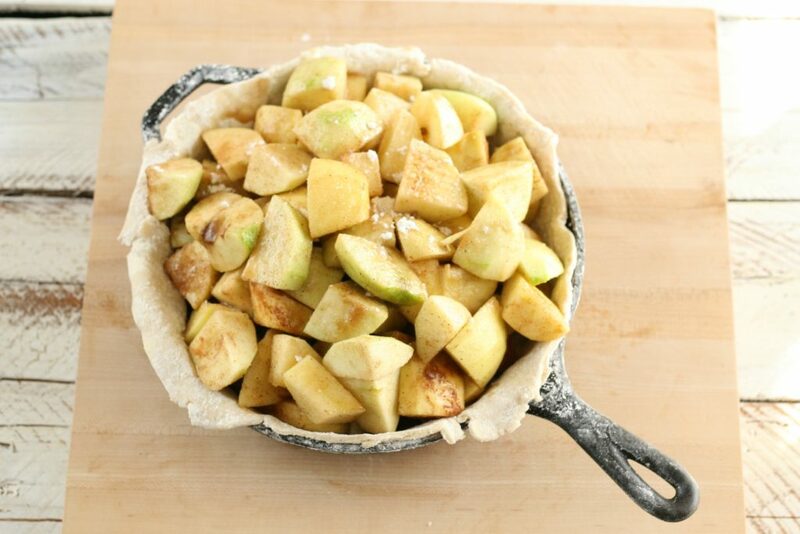 Baked in a Lodge cast iron skillet and using seasonal, locally grown apples. Growing up on a small farm, we always had homemade pies for dessert. My dad is French Canadian and it’s a fact, you must serve bread with dinner and have dessert. After I got married, we moved 6 miles away into our first house. And, I remember he was lost after I moved out. Because I always cooked dinner. So, several times a week he would join us for dinner. And if it was last minute, I’d scramble to whip up something for dessert. Because, you could be for certain he’d expect dessert! 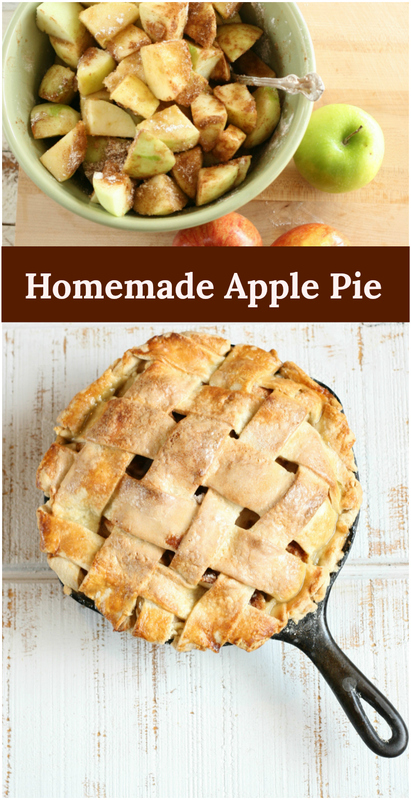 Inspired from my rural upbringing, you’ll want to try the Best Ever Homemade Apple Pie. This all-American dessert is a must in our household! Step 1: Place the apple pieces into a large bowl and coat with lemon juice, tossing with your hands or a large spoon. Set aside. Step 2: On a lightly floured work surface, roll out the bottom crust. Spray a 10 or 12-inch cast iron skillet with cooking spray or lightly coat with canola oil, using a clean paper towel. Place the rolled out crust in the bottom. Gently press into the pan lightly, using your fingers. Use kitchen sheers to trim the edges of the crust, to about 1/2-inch past the pan rim. Step 3: Use a slotted spoon to scoop the apples into the pan. Discard the remaining lemon juice. Sprinkle with sugar, cinnamon, nutmeg, and instant tapioca. Step 4: Roll out the top crust. Cut strips, using a small pizza cutter or pastry cutter. Place strips of pie crust all going one direction over the prepared pie. Pull back every other strip and place another strip of pie crust, going the opposite direction. Gently place the pie strips you pulled back, back into place. Repeat until you have completely covered the pie. Step 5: Trim the edges of pie crust with kitchen sheers and roll under the crust. Crimp with your fingers or press with a fork. Brush with an egg wash and sprinkle with granulated sugar. Step 6: Place in a preheated 400 degree F oven for 1 hour. When the crust is browned nicely, about half way or three quarters through baking, cover with a piece of aluminum foil. Slice a hole in the center of aluminum foil using a knife or kitchen shears. This will let the steam escape, allowing the pie to continue cooking and while not burning the crust. Use a sharp knife to check the softness of the apples. Let cool for at least an hour before slicing. Don’t forget to order sheets of parchment paper. They are so much easier to work with than the roll! 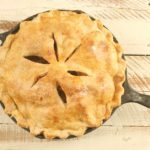 How do I make my pie crust flaky? Always keep your pie dough cold. Place it back into the fridge if needed. This keeps the fat particles cold and make the pie dough flaky. Sometimes I just use a simple crust and use a sharp knife to cut air vents in the top. Other times, I love a simple weaved crust. Just take a small pizza cutter or pastry cutter to cut strips of pastry dough. Then weave them back and forth. Tuck under the ends and crimp the edges with your finger or press down with a fork. Brush with an egg wash and bake for a little over an hour. My mom always liked the apples to be slightly soft, so that’s the way we prefer our pie. If you like your apples a little more firm, you can bake for less time. 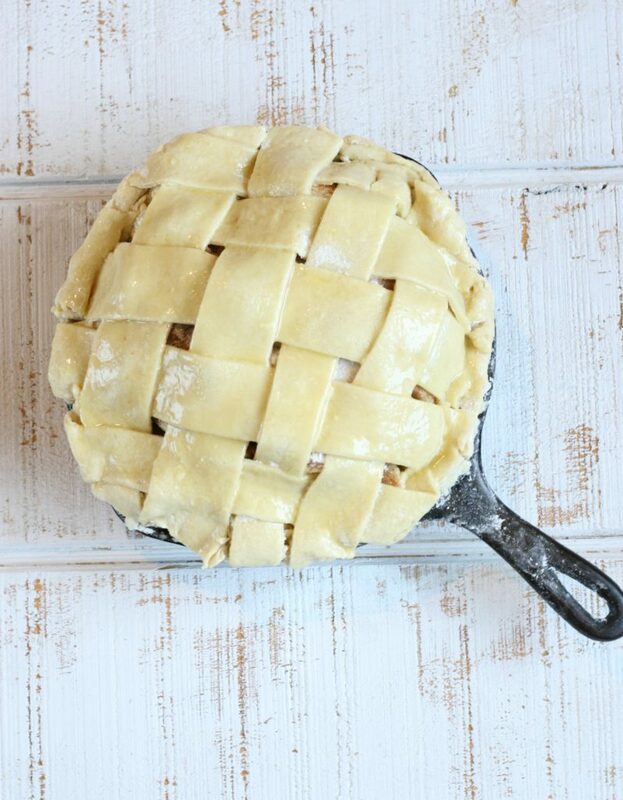 Let the pie cool before slicing, so your filling can set. Do you love my recipes?! I’d LOVE to hear from you! If you have a moment, leave a comment with a star rating. 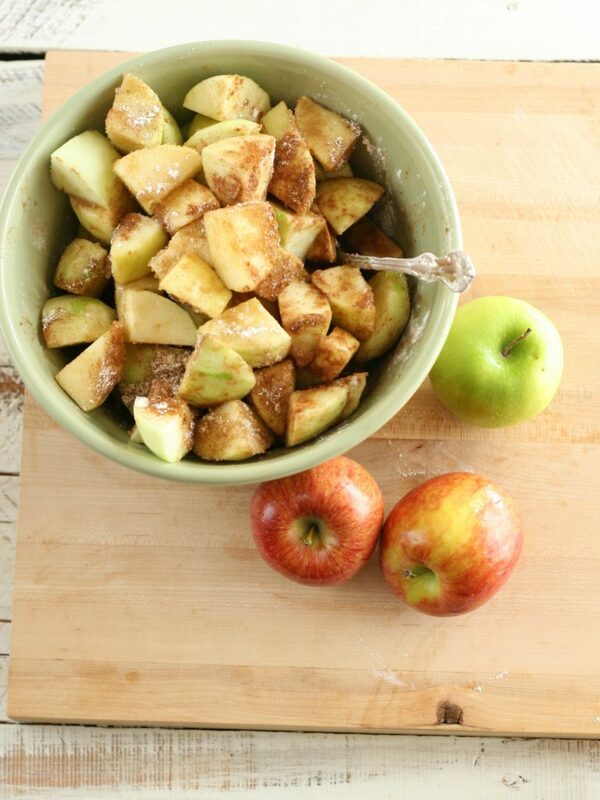 Place the apple pieces into a large bowl and coat with lemon juice, tossing with your hands or a large spoon. Set aside. On a lightly floured work surface, roll out the bottom crust. Spray a 10 or 12-inch cast iron skillet with cooking spray or lightly coat with canola oil, using a clean paper towel. Place the rolled out crust in the bottom. Gently press into the pan lightly, using your fingers. Use kitchen sheers to trim the edges of the crust, to about 1/2-inch past the pan rim. Use a slotted spoon to scoop the apples into the pan. Discard the remaining lemon juice. Sprinkle with sugar, cinnamon, nutmeg, and instant tapioca. Roll out the top crust. Cut strips, using a small pizza cutter or pastry cutter. Place strips of pie crust all going one direction over the prepared pie. Pull back every other strip and place another strip of pie crust, going the opposite direction. Gently place the pie strips you pulled back, back into place. Repeat until you have completely covered the pie. Trim the edges of pie crust with kitchen sheers and roll under the crust. Crimp with your fingers or press with a fork. Brush with an egg wash and sprinkle with granulated sugar. Place in a preheated 400 degree F oven for 1 hour. When the crust is browned nicely, about half way or three quarters through baking, cover with a piece of aluminum foil. Slice a hole in the center of aluminum foil using a knife or kitchen shears. This will let the steam escape, allowing the pie to continue cooking and while not burning the crust. Use a sharp knife to check the softness of the apples. Let cool for at least an hour before slicing. This will allow the pie filling to set. Enjoy with vanilla ice cream and whipped cream. That is an amazing pie!! Simple and beautiful! Ain’t nothing like the homemade classics!! I love a good old Apple Pie. Always a big treat in our house. This looks delish Yum! I love that you cook in the sugarhouse. I grew up on a farm with a summer kitchen that we cooked in, which I so miss that atmosphere of farm cooking. I pinned this for later. Baking in cast iron is the way to go. I have everything to make this except tapioca. I wonder if it would still turn out or if I should wait until I go shopping. Apple pie is my favorite pie. I make them every which way but I’ve never made them like this before. You could probably sprinkle a little flour over the apples before baking. I would toss them with a little flour. But tapioca is the best. Just thickens the apples so they are not runny. Just love your recipes,It”s good to see that beautiful cast iron great pics Girl !! LOL @ Dad expecting dessert! Those old habits die hard … and don’t go down without a fight! I also love that you used a cast iron skillet to bake your pie in! Can’t live w/o my cast iron! I’m not much of a baker but seeing this Apple pie makes me want to bake! I haven’t tried doing apple pie before. I think it’s high time to try my hands on this since my kiddos love apple. Ooh, I love apple pie! This one looks super delicious, I shouldn’t have come across the post at night time. Hungry now.. 😀 In any case, thanks for sharing! For anyone that’s not a baker, an apple pie is the perfect start. Use store bought crust if you’re worried about making it from scratch! I’ve never cooked a pie in a cast iron dish. Never thought of it actually. But that makes sense. That pie looks amazing btw! It’s how our grandmother’s and great grandmother’s used to cook. 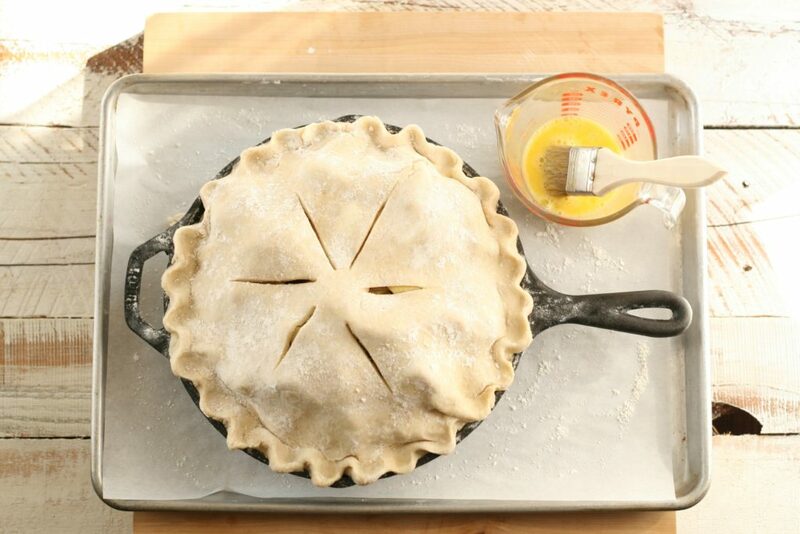 The cast iron actually makes the bottom pie crust stay firm and prevents it from being soggy. This is another great recipe from you. I will bake this for my kids too. Thank you. Nothing beats a good ole apple pie. Look tasty! Would love to try this one someday. Looks delicious! Love that to add tapioca to thicken the apples. Yummy! Let me prepare a cup of coffee for this one, hehe. That looks scrumptious! I can have this any time of the day, thanks for the recipe.